“So is like one of them the dad?” says a girl to her friend as we disembark the Tube. I pray to the musical gods that she isn’t talking about Mumford & Sons. They look about 18, all Boho chic and ripped spray-on jeans. The long drawn-out vowel sounds they insist on peppering their conversation with make everything last twice as long as it should. They appear to have very little of substance to say however, so this is an unfortunate marriage of pure tedium. “I aaaabsolutely LOOOOVE your refugee scarf” one drawls, without even really glancing at the other’s attire. Refugee scarf? Refugee scarf!? They seem like the kind of people who I saw suggesting on a charity website recently, that they would volunteer in The Jungle (Calais). When organisers asked them to take supplies across, they replied they were only interested in helping to do a ‘collaborative musical project with fellow student art-therapists and the refugees’ (an actual quote). Because pseudo-creative ego-massaging for the British middle-classes is exactly what the Jungle needs. Much better than food, clothes, or safe drinking water. I have decided in fact that they are probably reading History of Art at Exeter, or St Andrews or Durham, financed by the Bank of Mum & Dad. And their names are probably Talia or Georgia, or worse….any female name from classical literature (Ariadne, Andromeda, Persephone just a few horrifying examples). I have also decided that we are now mortal enemies. They are realising my worst fears. Are these the sort of fans that Mumford & Sons now attracts? As we traipse off towards the resplendent Roundhouse, I silently hope they will make a sharp turn soon and disappear down some alleyway to a painfully cool but over-priced speakeasy. They don’t. “What exactly IS a hoe-down? My friend said seeing Mumford back in the day was like going to one”, “I think it’s like a party in the country. Like in a barn with banjos. It sounds ghastly”. I let this one slide however as, to be honest, I’ve always wondered why exactly why it is called a hoe-down. I mean who are these hoes involved? And where or why are they getting down? Would this farm-based frivolity be something that David Cameron might enjoy? I’m half-surprised they haven’t seen a hoe-down before on television, as they rather look like Made In Chelsea extras, and a faux-party is normally the vehicle they use to promote ‘new bands’ on the programme. New bands that I fear Mumford and Sons are trying to ape. 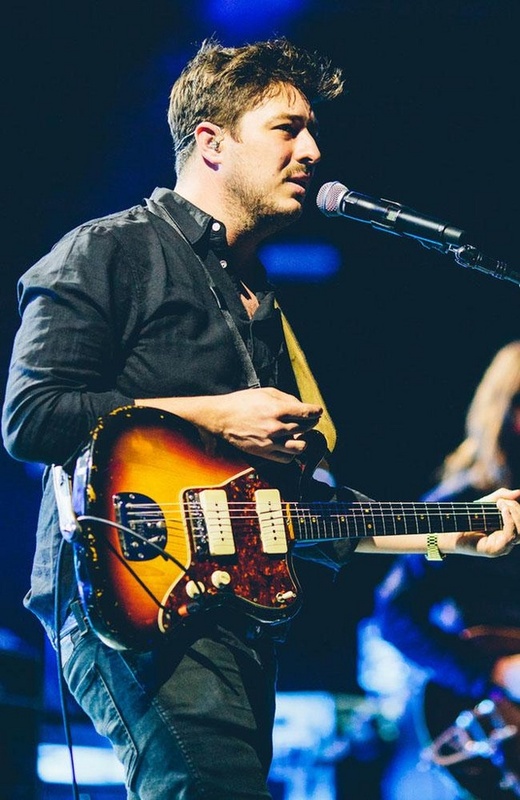 In case you’ve been living under a rock, you will know that with their new album Wilder Mind, Mumford and Sons are almost unrecognisable from the band in their previous iteration, both in look and sound. Out are the plaid shirts, signature waistcoat and twee landed-gentry couture. Out are the folksy mandolin and banjo-picked bluegrass sound. In is a more conventional driving guitar-based indie sound mixed with a soupcon of Alexei Murdoch (thank goodness). In are peacoats with turned up collars, long hair (think Jared Leto meets Simon Neil), an (inexplicably early) Movember ‘stache treading the fine line between Hitler and Magnum P.I. They mooch around with sullen thousand-yard stares and a smart ‘I’m trying but I’m not trying’ style ripped straight from a catalogue (aiming for Abercrombie but achieving River Island). So, I suppose we should cover some music. As expected, they are an excellent live band. Also as expected, they are using this to promote several tracks off their most recent album. Some tracks sink, Snake Eyes, Wilder Mind and Believe underwhelm. Others soar, The Wolf, Ditmas, Hot Gates, Cold Arms and Monster make me hopeful for the future. The indie sound is obvious, they sound like a lot of other bands out there, but they do it fairly well. The addition of a session drummer is only noticeable in that you didn’t realise the lack of percussion in their previous music. They play the requisite hits, I Will Wait, The Cave and Little Lion Man. Their older songs triumph however. Slightly lesser-known tracks like Lover of the Light (from Babel) or Thistle & Weeds (from debut album Sigh No More), make me shed a wistful tear and make my heart ache for the Mumford of old. Pre Carey Mulligan, pre musical direction-change, pre makeover. Back when they were distinctive, different, uplifting and happy. Listening to their music used to fill me with the joys of life. Now it makes me wonder what American television show their tracks have been used on, and when Talia or Persephone will try and perform an acoustic duet version at a poetry slam in Shoreditch. Mumford & Sons have clearly adapted to survive. They remain commercially successful, but devoid of the beautiful soul that previously made them so special. And unfortunately, no amount of album sales and TV exposure can fill that hole.